For customers needing a more traditional planetarium theater experience, Go-Dome™ offers domes with rings. These rings give the dome a vertical wall below the projection surface. The rings are inflated by the same fan that inflates the dome. Each ring has a diameter of 30 cm (1 foot) and up to 5 rings can be provided for the spring line desired by the customer. The primary purpose of the rings is to raise the projected horizon in the dome. By using 3 or more three or more rings standard folding chairs can be used in the dome for seating and the fulldome image is projected above the heads of the seated audience. One or two Rings hold the dome diameter and adds to stability. Three to five Rings provide a wall against which chairs can be placed. Customers wanting a dome structure with chairs often choose the ring dome. 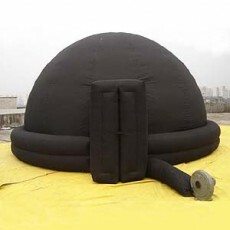 These domes are heavier and therefore not as portable as the standard dome, but find many applications where a dome is set up for more than one day or even as a temporary theater in museums or other public spaces such as malls, lobbies, and common areas. Ring domes have been made in sizes ranging from 4-meter domes fitting in trade shows or classrooms with tall ceilings to 8-meter portable theaters. The rings are permanently attached to the dome and are not detachable in any way. Likewise Rings can not be added to a standard dome. Ring domes are available in blue or black standard cloth.